Freegun heren boxershort 'Russia' NIEUWSTE TREND! Freegun heren boxershort 'Giant' marine/geel NIEUWSTE TREND! Freegun heren boxershort 'Giant' kobalt/roze NIEUWSTE TREND! Freegun heren boxershort 'Duo Comic' NIEUWSTE TREND! 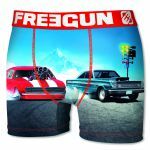 Freegun heren boxershort 'Comic' zwart NIEUWSTE TREND! Freegun heren boxershort 'Comic' paars NIEUWSTE TREND!